1.Take brown sugar and butter, (Topping) combine and melt in a saucepan on medium heat until the mixture is bubbly. 2. Pour mixture into a 10 inch diameter stick-free or greased cake pan with 2 inch high sides. 3. 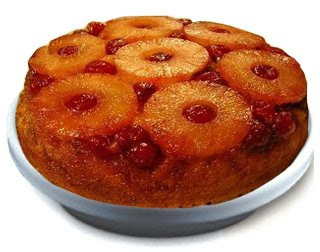 Arrange pineapple slices in a single layer on top of the mixture. 3. In a separate bowl, cream the sugar and butter together until light. Add eggs one at a time, beating after each addition. Add vanilla. 4. Add dry ingredients to the above mixture. Pour cake batter over topping and pineapples in the pan. 5. Bake cake until tester inserted into the center comes out clean, about 45 minutes. Cool cake in pan on a rack for 10 minutes. Turn cake out onto a platter. Serve warm or at room temperature.